Hey Blizzard Watch, it’s hammer time! At the beginning of each new expansion, Protection Paladins face the decision of how to get the cap and be ready to raid with our guilds in the most expeditious way possible. For pretty much every prior expansion, the best advice told us to put away our shield, speak softly, and carry a big stick. I’m a bit of a contrarian myself, and fortunately Protection leveling has some inherent benefits in Legion. Changes are coming to our beloved Tankadin. Old spells are going away, new spells are coming, and some spells, like Avenging Wrath, are coming back. Leveling as Protection gives you plenty of practice working through your new rotation until it becomes second nature. By the time you start into dungeons and raids, you’ll be able to concentrate on whatever terrible thing the boss is about to do while your rotation is on auto-pilot. It will also give you opportunities to adjust to the new longer cooldowns on our emergency buttons. Playing as Protection gives you access to both Rebuke and Avenger’s Shield’s interrupt. Throw in a couple of Grand Crusader procs, and you can lock down caster mobs limiting the damage they can do to you. The death penalty in World of Warcraft hints at our most valuable resource while leveling. Running back to your body, resurrecting, and healing back up costs precious time. As every Goblin will be quick to remind you, “Time is money, friend.” You are far less likely to die in the field as Protection than you are as Retribution. 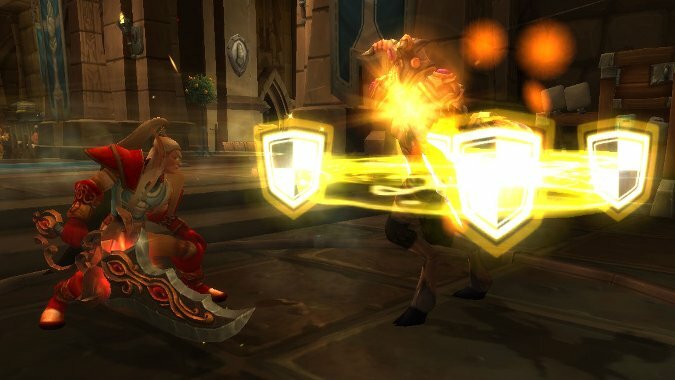 With the loss of Selfless Healer, Ret Paladins no longer have a way to get an instant Flash of Light. Ifthey get low on health, they have to stop attacking to cast a heal. As Protection, Light of the Protector is instant cast and we even have an Artifact Trait that buffs it. A tangent to the whole not dying thing is having little fear pulling a rare (silver dragon) mob. All the rares I’ve encountered in Legion are multi-tap which encourages other players to jump in and help you kill it, but they want someone else to get the party started. Rares have some nice drops and many of the items I found that grant Artifact Power came from killing them. I spent my early WoW career, from patch 1.9 through Cataclysm, on the PVP server Altar of Storms. While leveling in each expansion, when enemy players saw me in Protection spec, often they would choose to not engage me. Most other classes see us as time-consuming to kill. They often use unflattering insectoid metaphors, but this is mainly born of frustration. If you find yourself on a PVP server, another option is to party up and party on, excellent, with a cross-realm friend from a PVE server to level. Pulling an entire camp and using AOE to take it down is the quintessential Tankadin leveling plan going back to the days of the “Porcupine” spec fueled by Holy Shield, Reckoning, Redoubt, Retribution Aura, and a Shield Spike for good measure. We get Retribution Aura back in Legion, and I’m a fan of Last Defender talent — tailor made for that old “CC = Continuous Consecration” gameplay. For any previous expansion, Ret’s Lightning McQueen speed more than made up for Protection’s perks, nice as they are. This time around, however, we also have to consider the Artifact. You need to level up your Artifact with its associated Traits and Relics. If you aren’t familiar with how the Artifact works with dual spec, please check out this column by a handsome Dwarf I know. You’ll have both the Protection Artifact, Truthguard, and the Retribution Artifact, Ashbringer, for the lion’s share of your leveling, but consider which one you’ll get first. I’m not sure about the other zones, but both in Stormheim and again in Highmountain, I found quests that awarded Relics. If you get these quests before level 102, you will only have one Artifact and you only get the Relics for the Artifact you have, regardless of your spec when you turn the quest in. Once you have two Artifacts, you get the Relic for the currently equipped one. Had I taken Ashbringer first, I would have gotten Ret Relics from those early quests. Since I took Truthguard first, I got the Prot Relics and one of them was a nice boost to my soloing, and another was for the best Artifact Trait in the game. The next question becomes how to divvy up your precious Artifact Power. Each Artifact has separate Artifact Power, so there are a couple of different paths you could take. Truthguard with Artifact Power: Level as Protection with Truthguard and spend your Artifact Power on Truthguard. You won’t need to play catch up as you approach max level. Ashbringer with no Artifact Power: Level as Ret with Ashbringer but spend most of your Artifact Power on your Truthguard. Again, you won’t need to play catch up, but the Artifact Power isn’t helping as you level. Ashbringer with Artifact Power: Level as Ret with Ashbringer and spend most of your Artifact Power on Ashbringer with the plan you’ll catch up your Truthguard at or near max level. Ret with a maxed out Ashbringer should do more DPS and by extension kill stuff faster than Prot with a maxed Truthguard. If that’s not a true statement, then something is wrong with the class balance, but we have no intention of maxing out our Ashbringers, pretty as they are — at least not right away. We want to dump most of our Artifact Power into leveling up our Truthguard. When you reach raids, there will only be two tanks and the boss is only going to hit one at a time (for the most encounters). Either you can take the hits and not run your healers out of mana or you can’t. On the flip side, there are many other DPS in the raid. If you’re a little light on DPS, a dedicated DPS player can help make that up. If you are a little light on surviving pretty much all the raid will be doing is looking through your pockets for loose change. But Ashbringer isn’t the only Artifact that can boost your DPS: several Traits for Truthguard do so as well. Our DPS traits increase DPS by a flat 1% when you open them. Righteous Crusader increases Shield of the Righteous‘ damage and Truthguard’s Light increases all your Holy damage (and really, what do we do that isn’t Holy damage). I decided to do a little test, Mythbusters style. I engaged a bunch of normal mobs in my Protection spec using Truthguard with two Relics and two ranks in one Trait. I then went back over the same area as Ret with my Ashbringer that had no Relics and 0 Artifact Power. Though it represents a subjective measure and may represent a preexisting bias, I will say I enjoyed my time as Prot more than Ret. Ret felt disjointed, like something was missing, and didn’t flow as well as Prot did. My objective metric was Time to Kill (TTK). I picked a place in Stormheim with a good mix of caster and melee mobs and made sure to pull only single mobs. I didn’t want to round them up and Consecrate because I thought that might skew the test in Prot’s favor. I did the test as soon as I got both Artifacts to see the least amount of Artifact Power I would have gotten for Truthguard. I killed 25 mobs as Protection and 25 as Retribution. I made sure each group of 25 contained the same number of mobs (7 casters, 7 melee, 7 elementals, and 4 bears — because I agro all bears). I only counted time spent in combat. 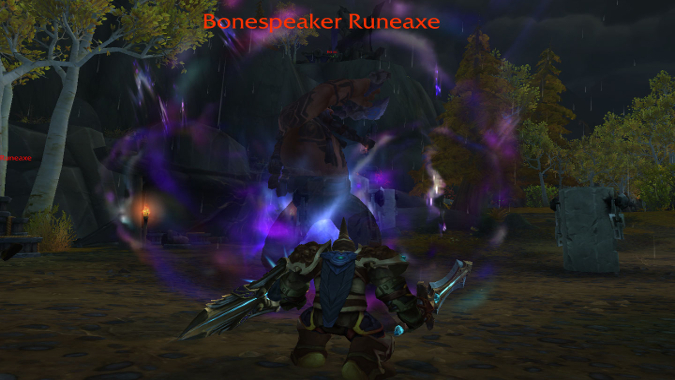 I went into the test with the full expectation that Ret would kill stuff faster. The only question in my mind was to quantify how much slower I’d be as Protection and then weigh the ancillary benefits of Protection against the time delta for Retribution. But as Lee Courso might say: not so fast, my friend. My sample size was small, but this indicates to me that your Artifact Traits play a large role in how well your spec performs. For a final test, I engaged an elite quest mob named Stonefang. The results speak for themselves. I killed him easily as Protection in about 90 seconds. As Retribution, not only did I die on my first attempt: it took over two minutes on my second. As Prot, I could eat the Resonating Plate attacks easier. 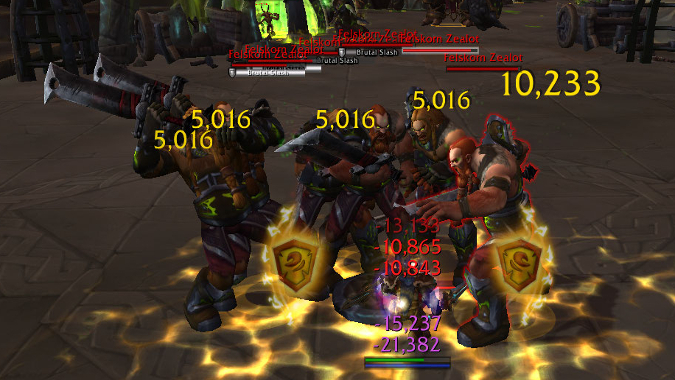 As Ret, I had to kite more often and several times I had to stop attacking to heal up. The addition of the Artifact makes Prot a competitive leveler to Ret. Given the other perks that Prot gives you, for me, it is a easy choice. Will you go Ret, Prot, or Holy to level? What other questions are burning in your mind as Legion’s launch date draws ever nearer?